We originally posted this story and infographic on Memorial Day 2014, but, gosh darn it, we think it's interesting enough to post again! 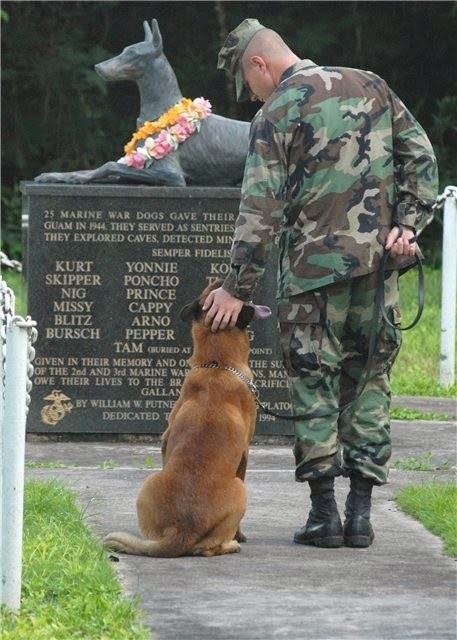 Human and dog soldiers paying tribute to fallen Marine canines. As we celebrate the close of a long weekend, hopefully with a cookout and lots of friends and family, we imagine that you will take a few moments to honor our fallen soldiers. Hundreds of thousands of brave men and women have given their lives for our country, and alongside them have fallen countless canine soldiers, who rightfully deserve tribute. To honor these four-legged heroes, our friends at Pet360 have compiled a fascinating description and accompanying slide show of the most common dog breeds serving our country. We tend to think of the German Shepherd and Belgian Malinois as the top military dog breeds, but there's a lot we didn't know about the wide variety of breeds used and why. And to provide a few conversation starters at your picnic today, or if you just like to sound like a know-it-all, Forbes has put together this cool info graphic to help us remember exactly why our country has set aside this day for remembrance of our fallen soldiers. Here's to a satisfying Memorial Day to all of our blogging friends! Thank you for this great post, Bocci. We are so grateful for the heroes - four-legged and two-legged - who gave the ultimate sacrifice for us all. Hey, we updated the Pet360 link! Duh on our part!